In the Crimson's two games against the Big Green, Juzang has been the team's leading scorer in both contests, combining for 39 points. 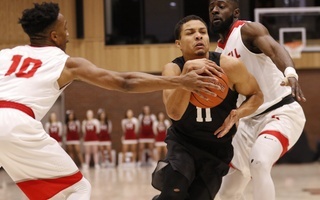 Bryce Aiken slammed the ball to the ground in frustration, as the normally level-headed Coach Tommy Amaker yelled at the official, “You’re better than that!”. Trailing at the time by a 43-39 score midway through the second half, Harvard thought it had secured a steal and a transition bucket, but a referee signaled for a late jump ball — a questionable call that palpably intensified the atmosphere within Lavietes Pavilion, and spurred the Crimson to a nail-biting, come-from behind 64-59 win over Dartmouth. Two weeks after suffering an 81-63 defeat in Hanover at the hands of the Big Green (10-8, 1-1 Ivy), Harvard knew it had to lock down Dartmouth’s three-point shooters, and feed off of the home crowd at Lavietes Pavilion to avoid an 0-2 start to Ancient Eight play. 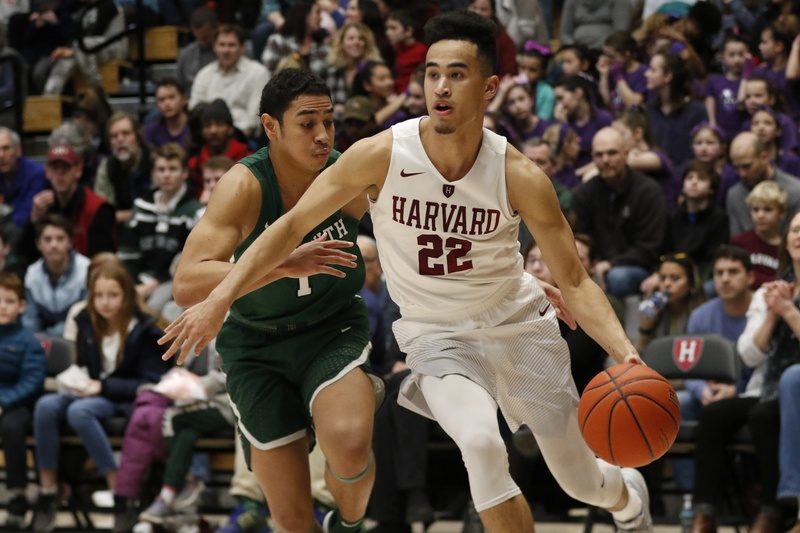 A loss would drop the Crimson to the bottom of the Ivy League standings, and afford the Big Green its first sweep of Harvard since the 1998-1999 season. But strong ball security, and clutch free-throw shooting down the stretch from Aiken helped the Crimson move to .500 on the young Ivy League season. Despite the urgency present for Harvard entering Saturday’s contest, both teams got off to a slow start offensively, struggling to knock down shots with consistency. Despite holding a seven-point lead early in the half, the Crimson entered the intermission trailing 26-25, facing a crucial second-half test. Harvard struggled to corral Dartmouth’s freshman Taurus Samuels, who finished with a career-high 13 points for the Big Green. The junior guard was once again a focal point of Saturday’s contest, in his first home game in almost a year. The Randolph, N.J., native struggled through much of the first half, and finished with 14 points on just 4-of-14 shooting, but banked home a key basket and nailed four consecutive free-throws in the dying seconds to help secure the Harvard win. 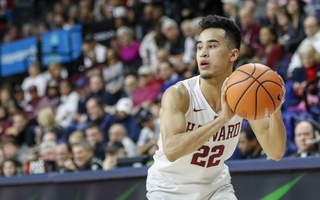 The return of the former Ivy League Rookie of the Year has helped the Crimson to two consecutive wins over Howard and Dartmouth. In junior guard Bryce Aiken's second game back, the Randolph, NJ native tallied 14 points, all in the second frame. As clocked ticked down under three minutes at Lavietes Pavilion, #11 took over the game, like his teammates and coaches were accustomed to. Driving through contact, Aiken banked home a layup to give Harvard a 60-56 lead. Then, with the Crimson clinging to a one-point lead in the final 20 seconds, the junior was sent to the line for two consecutive 1-and-1 situations. 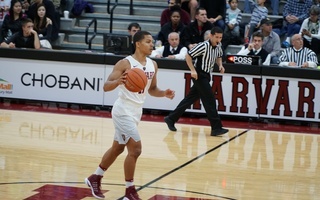 After rattling the first free-throw home, Aiken’s next three swished through the hoop to seal an important win for Harvard. The ball security that the Crimson demonstrated throughout Saturday afternoon’s contest, was as big a story as any individual statistics. For the first time all season, Harvard committed fewer than 10 turnovers, only losing the ball nine times, and winning the turnover battle. Juniors Christian Juzang and Chris Lewis played crucial roles in anchoring the Crimson’s attack, finishing with 19 and 16 points respectively. Juzang chipped in five assists while turning the ball over only once, as Lewis secured eight rebounds to help the hosts to a 40-33 advanage on the glass. 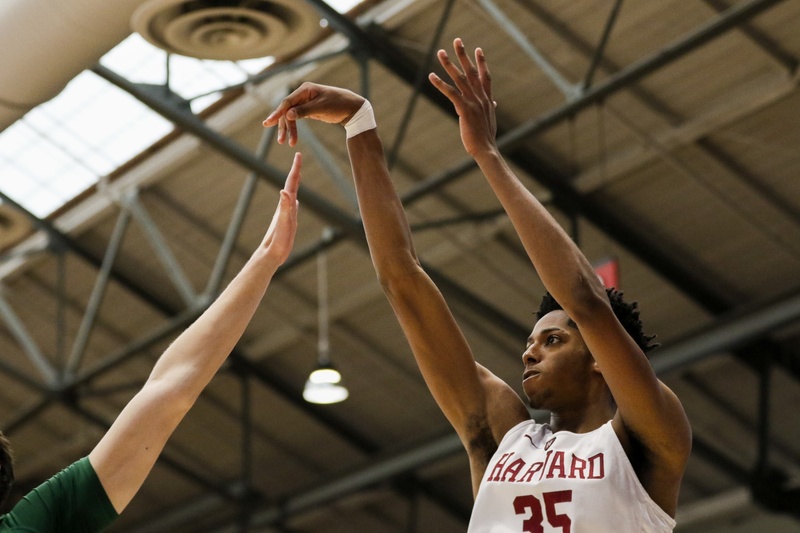 The Tarzana, Calif., native has been one of Harvard’s steadiest players all season, and the return of Aiken has allowed Coach Amaker to play both guards together, creating a dynamic backcourt for the Crimson. Junior forward Rob Baker saw 24 minutes of action, finishing with five points. 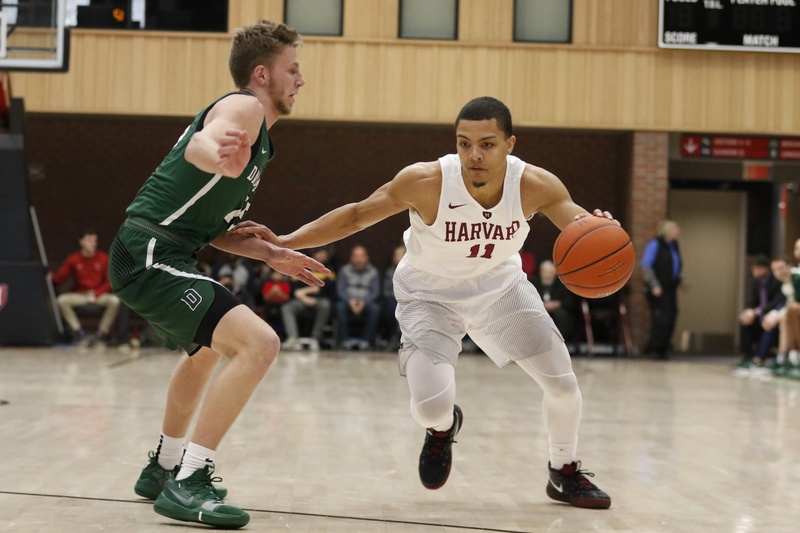 A much improved Harvard defense protected its home court Saturday afternoon, allowing 22 fewer points to Dartmouth than it had two weeks ago. Neutralizing the shooting of the country’s leading three-point shooter, Brendan Barry, was a testament to the team’s selfless and group-oriented defending. While the Big Green nailed three after three two weeks ago, Dartmouth failed to knock down a single triple in the final four and a half-minutes. The Crimson will hope that a mini-win streak, and the return of Aiken, will help catalyze the team as the Ivy League season continues.